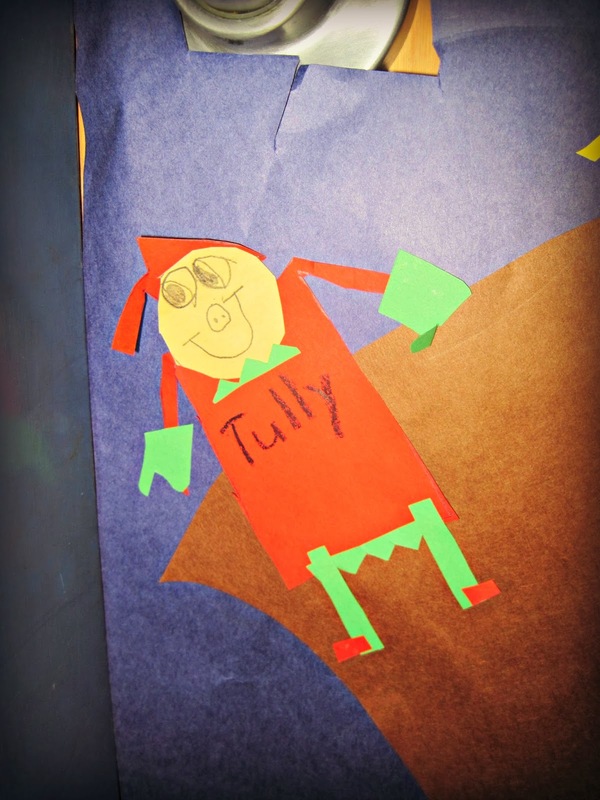 I was at Pierce's school recently for their Winter Wonderland event, and I was captivated by the artwork on his class's door. A sleigh filled with elves, and pulled by reindeer made from the children's handprints. It was adorable. And then I saw Pierce's elf on the back of the sleigh. Modeled after our Elf on the Shelf, it was so cute and sweet I had to take a picture. I will be taking tomorrow off, but I wish you all a Merry Christmas and Happy Holidays! We always did gift giving on Christmas Eve with our kids. Your "four gifts" Christmas tradition is so neat! Hope you have a great time together! All of the boys smiling at the same time including Santa. Have a good time! Merry Christmas! I love your son's cutout of his "Elf on the Shelf." So cute!! Have a wonderful, wonderful holiday! What a fantastic Santa picture! Merry, Merry, Happy and Bright! I like you four idea . . . nifty. The Elf - referencing all the love and family tradition . . priceless. Sending LOVE to You and Yours! i like the 4 gifts idea for the kids. i do hope you all enjoy it. Merry Christmas Eve to you and your family from ours! 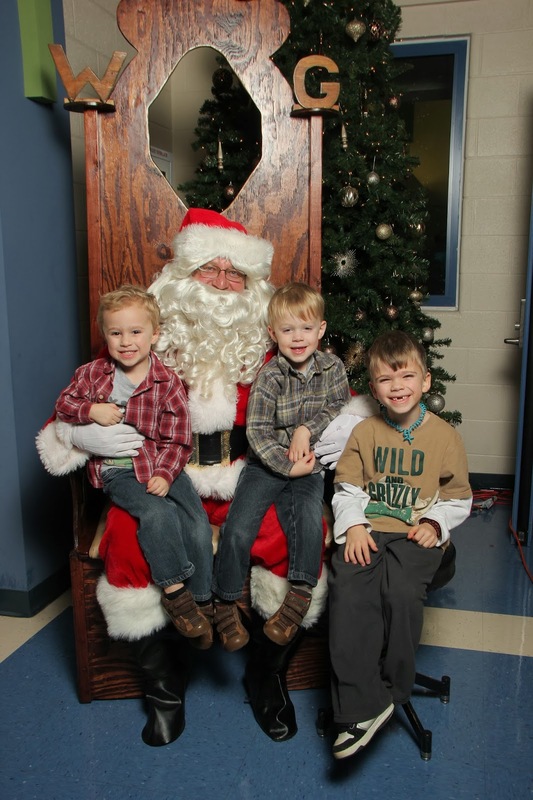 What a sweet photo of the boys with Santa! And Pierce has such an imagination. That elf is very creative. It has been a long time since I've been around little ones on Christmas--not since my nieces and nephews, now grown, were little. It's so much fun to see their excitement. I know you must enjoy being in the midst of such sweet fun. Merry Christmas to you and your family, Lisa!! Back at ya, Lisa. Merry Christmas. That's a great tradition, Lisa. LOVE the photo. They are so cute! and know you will have a wonderful day tomorrow. Blessings! I really like the four gifts tradition. I think I'll do that with my kids someday. The last photo is really cute! Merry Christmas! Merry Christmas to you and your family. I hope the coming year is a good one for you all. love how you're keeping things simple with the 4 gifts. Merry Christmas to you and yours. Merry Christmas to you and your family, Lisa. That sounds like a wonderful new tradition, the 4 gifts idea. I like it! Happy Holidays and all the best for the end of this year! The Santa picture is adorable. I love that his elf looked like your elf on the shelf. That is so adorable. I LOVE the four gifts idea! We always have too much, don't you think? This year, we bought for a friend who struggles raising her grandson. I had more fun buying for him and making sure he had books, games, new socks, pajamas, some clothes, and some Legos. It was nice to spread the joy to someone else--although I will admit to really, REALLY having fun buying for him. :) We skipped presents for each other and just bought for him instead. I need to do more of that next year. Cure pictures! Love the elf! Lisa, I greet you in the New Year 2014. Congratulations on a wonderful blog. Greetings from far away Polish.